It measures 3cm x 2.5cm x 0.5cm and is made of three layers of glass. A base layer of Lilac, Red and Gold . 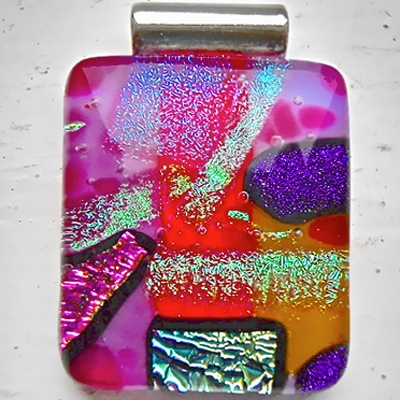 Then a layer of many pieces of different colours of Dichroic glass. Pink, Purple, Gold and some others. The final layer is thick clear glass which makes the pendant very chunky and shiny. It comes with a 16" x 1mm Sterling Silver chain in a Black card gift box.